As a Christmas gift, I've been sparring at WUWT with folk who insist that raw temperature data is hidden/deleted/not available. I point them, of course, to GHCN Daily. But there was much talk of BoM, and I must admit that the data page isn't as obvious as it was. But it is there. And not only can you get an unadjusted daily file for just about any station they have, back to start, but you can download zipped csv files for max and min (but not together, unfortunately). And there is also extensive metadata. On to interesting times. Here is Sou on Mike Mann's court victory. And Eli. GISS rose 0.07°C in November. 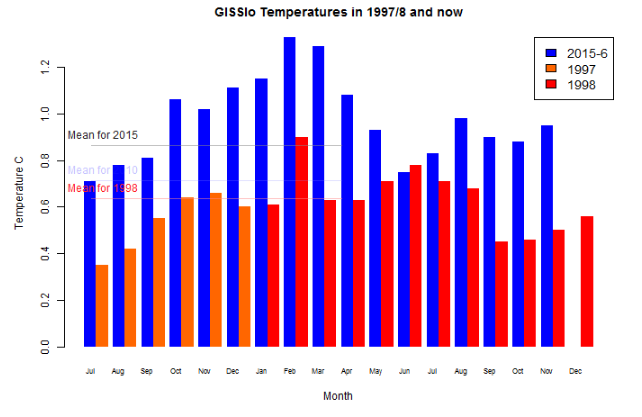 GISS is up from 0.88°C in October to 0.95°C in November. That is similar to the NCEP/NCAR rise, but contrasts with a small drop in TempLS mesh and a larger one in TempLS grid. I think a lot of the changes this month will reflect the different treatment of the October freeze in Siberia and warmth in the Arctic. A plot has been in circulation for some time from John Christy. It is a version of one that he showed at a US Senate hearing, and is discussed here. I don't know if it was ever accurate, but it ends in 2013, so obviously needs updating. It's also woth showing the other surface datasets, and definitely not showing the troposphere record, which I don't think is honest. 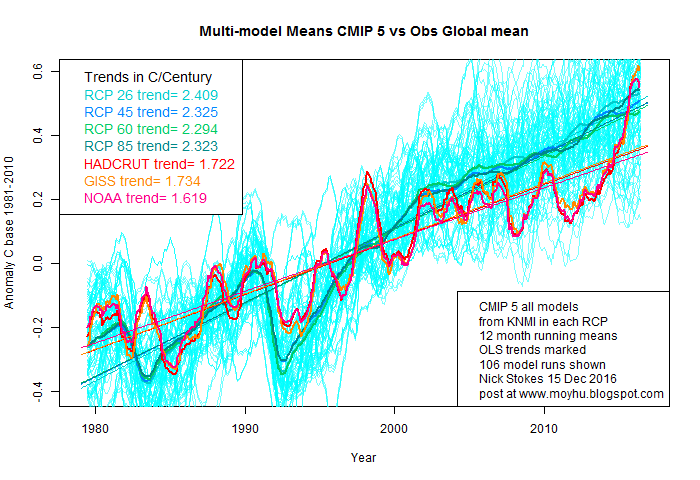 The CMIP data is for surface, not troposphere. So I have made my own version, using CMIP 5 data from KNMI. I have used their averages for the RCP groups, and their collection of 106 model runs (one per model/RCP), which is shown in the background. The complete data and R code for the plot are in a zipfile here. It's a very different picture. The observations, as expected, are far more volatile than the multi-model means, and the slope is somewhat less, but is far from out of range. And of course, recent warming actually takes observations above the mean. 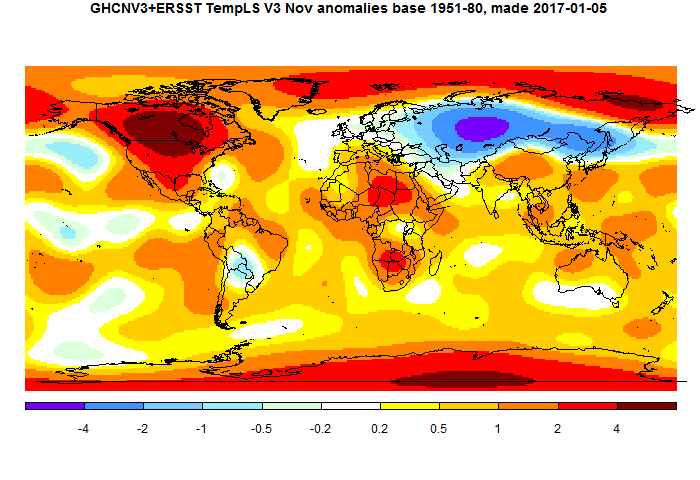 I have set the anomaly base for all curves to 1981-2010, the WMO recommendation. Storing data for the winter. and it will change in the obvious way for future months. I'll probably put a table of links on the portals page, once a few have accumulated. I'll look for other opportunities to back up. I'm actually more dependent on current data like GHCN, ERSST and AVHRR data, and the reanalysis. I'm more optimistic there, because that data is collected for weather forecasting, which has powerful clients. So while access may be bumpy, I don't think it will be lost. While arguing at WUWT, eg here, about Hansen's projections, I've been encountering arguments about which scenario should be applied. I did discuss that in last month's post on the projections. But I have since looked up more information on what they were, and how they panned out. In this post, I'll review the files, numbers, compare with current, and post what data we have. 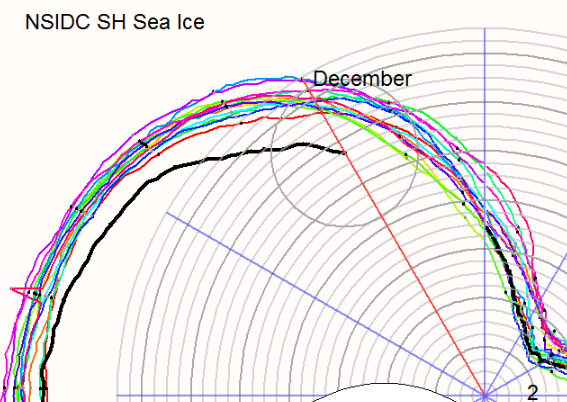 I'll also review a discussion by Stephen McIntyre at Climate Audit in 2008, and show some of his graphs. 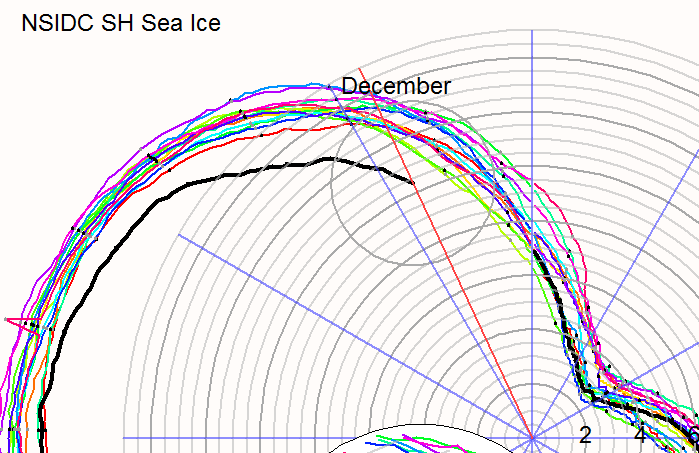 The conclusion is that based on input and outcome, the temperatures should lie between scenarios B and C.
Global TempLS unchanged in November; sea ice is low. The November TempLS mesh index was virtually unchanged, at 0.687°C in November from 0.692°C in October. The TempLS grid index declined, from 0.626°C to 0.56°C. The disparity between mesh and grid is unusually large, and is caused by the polar warmth, which LS mesh is more sensitive to. Other indices generally rose in November; NCEP/NCAR index by 0.06°C, and also UAH lower troposphere (0.04°C). The main map features are a cool band across Siberia, and big warmth in North America. Antarctic was warm, also Arctic. Where do GHCN monthly numbers come from? A demo. I've been arguing at WUWT, eg here. More and more I find people saying that all surface measures are totally corrupt. Of course, they give no evidence or rational argument. And when sceptics do mount an effort to actually investigate, eg here, it falls in a heap. BEST was actually one such effort that was followed through, but ended up confirming the main indices. So of course that is corrupt too. As linked, I do sometimes point out that I have been tracking for six years with an index, TempLS, which uses unadjusted GHCN and gets very similar results to GISS and others. I have posted the code, which is only about 200 lines, and I have posted monthly predictions (ahead of GISS and all) for about six years. But no, they say, GHCN unadjusted is corrupted too. All rigged by Hansen or someone before you see it. The proper way to deal with this is for some such sceptic to actually follow through the quite transparent recording process, and try to find some error. But I see no inclination there to do that. Just shout louder. So here I'll track through the process whereby readings in my country, from BoM, go through the WMO collection in CLIMAT forms, and so into the GHCN repository. That's partly to show how it can be done, if a sceptic ever was inclined to stop ranting and start investigating. NCEP/NCAR November up 0.06°C - warmest since April. The Moyhu NCEP/NCAR index rose from 0.419°C in October to 0.48°C. Not huge, but it makes it the warmest (just) since April, an ENSO peak month. The change mirrors a rise to November of 0.04°C in UAH V5.6. The month started with a big peak, then a dip, then a smaller peak, still current. The big feature was a cold band across Siberia, extending into N Pacific. But it was balanced by warmth in Arctic, Antarctic and N America.